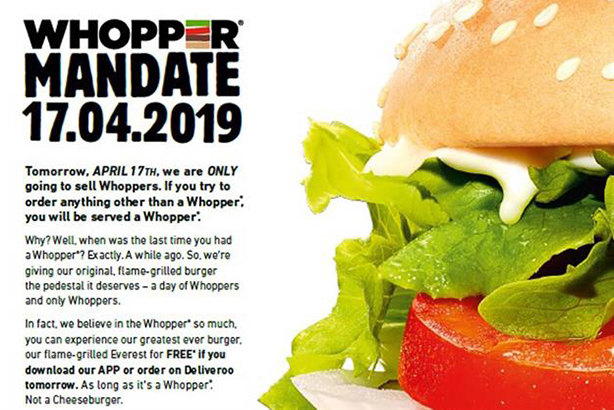 Burger King is tomorrow launching "The Whopper mandate", a promotional day in which it will offer its signature burger, the Whopper, for free to customers who download its app – but anyone hoping to order anything else will be out of luck. An out-of-home and press campaign, created by Bartle Bogle Hegarty London, launched today to outline the terms of the deal and this will be followed by a pair of films that will run tomorrow. Burger King said it is the first UK campaign for the Whopper in a decade – although marketing stunts for the product have included #WhopperExchange, on Boxing Day 2016, when consumers were invited to trade in unwanted Christmas gifts for a burger. Outside the UK, the Whopper featured in 2017’s "Google Home of the Whopper", from Miami’s David, which attempted to trick Google’s voice assistant into reading out information about the Whopper. In 2016, Buzzman created "Whopper blackout", a seven-minute film for Burger King France that told the story of what happened when Burger King exited the country in 1997.